Reproduced with permission, in modified form, from Glass on Metal 1985, vol. 4. The art of firing photographs on enamel and glaze surfaces has been practiced since about 1850. The art has never been widely spread, but it has never been a lost art. At no time has more than a few people, world wide, been involved. Never the less the art is still alive, with a few people producing beautiful photographs. The difficulty in obtaining durable and permanent photographs during the early years sparked the interest in photographs fired on enamel and glaze surfaces. However, with the continued work the permanency of photographs on paper improved to the point where their convenience more than offset the superior permanency of photographs fired on enamel or glaze surfaces. Thus paper became the most common support for photographs. Thousands of portraits on enamel for home viewing were made well into the beginning of the previous century. Perhaps 99% of the enamel photographs made today are displayed as memorials on cemetery monuments. A number of readers have requested information concerning the procedure. There are several workable methods, each having some advantages as well as disadvantages. None are extremely complicated, but they all require careful attention to details and the ability to accurately duplicate each step time after time. We hope, as a result of this series, a few enamelers will spend the time and effort required to develop the skill to make and promote enamel portraits for home and museum viewing. The accomplishment is very satisfying. The history of enamel photography is so interwoven with the history of photography in general that we feel the best way to cover our subject is to give a brief chronological history of photography, indicating when enamel was involved. We will then describe, step by step, several methods which most readers will be able to master. In addition general directions will be given for other methods. Photography was officially announced January, 1839, when both Daguerre’s and Talbot’s inventions were made public. Actually permanently fixed images of the camera obscura had been made by Niepce in 1826 and by Talbot in 1835. Similar to many inventions the basic fundamentals were known separately for years without anyone thinking to combine them. The camera obscura was known to the Arabian scholar Ibn Al-Haitham before 1038. Although Roger Bacon mentioned spectacle lenses and they apparently were well known by the end of the thirteenth century, a lens was first utilized in the camera obscura in 1550 by Cardamo [ 1 ]. The darkening of silver nitrate on exposure to sunlight was recorded by Angelo Saia in 1614. The fact that the darkening of silver salts can be applied to the making of images was discoverd by Johann Heinrich Schulze in 1725 [ 2 ]. Knowledge of the chemical as well as the optical principles of photography was fairly wide spread following Schulze’s experiment. The information found its way not only into serious scientific treatises but also into popular books of parlour tricks. Surprisingly it was 1802 before Thomas Wedgwood and Humphry Davy published a paper entitled, An account of a Method of Copying Paintings upon Glass and of Making Profiles by the Agency of Light upon Nitrate of Silver, with Observations by H. Davy. Wedgwood was apparently the first to unite the two strands of knowledge. One source indicates he was a brother of Josiah Wedgwood the porcelain manufacturer [ 3 ]. Another source indicates he was the son of Josiah [ 4 ]. Wedgwood moistened white paper or white leather with a solution of silver nitrate. Using a camera obscura he made prints of leaves, copied paintings made on glass, and profiles of sharp shadows on a white screen. The image could be examined by candle light, but when exposed to daylight the reaction on the silver nitrate continued until the print was black. No means were found at this time to fix permanently the impressions thus produced [ 5 ]. Sir John Herschel discovered in 1819 that sodium thiosulfate would dissolve silver chloride [ 6 ]. He incorrectly called the substance hyposulfite of soda, hence the shortened name hypo which has been in common use since. Later Herschel coined the word photography, which means to draw with light, to replace the older term photogenic drawing. In 1813 Nicéphore Niepce was engaged in a task identical in conception with that of Wedgwood. He used bituminous varnishes and metal plates to fix permanently the images of the camera. Light is capable of hardening a bituminous surface in such a way that the usual solvents of bitumen no longer act readily upon the altered part of the surface, and therefore only the shaded portions of a partly illuminated plate would yield to such solvent as naphta [ 7 ]. The process was called heliography. Later we will see how this technique was used, for a short time, to form photographic images which were fired on enamel surfaces. In 1829 Niepce entered into a partnership with Louis Daguerre, and the two tried to improve the heliograph process but failed to do so before Niepce’s death in 1833. The daguerrotype process was announced January 7, 1839, however the process was not described until July of the same year. On January 13, 1839 Fox Talbot published the process he developed in 1835. The daguerreotype process used either polished silver plates or silver plated copper plates fumed with iodine vapors to form a layer of silver iodide. These were exposed in the camera obscura and then treated with mercury fumes to produce a positive image. The unexposed silver iodide was removed with a solution of common salt or with a hypo solution. The exposure time was subsequently shortened to a few seconds by using both iodine and bromine vapors. We know of no attempts to utilize this technique in enamel photography. Talbot’s method consisted in washing letter paper repeatedly with alternate solutions of salt and nitrate of silver. At a certain stage a surface was obtained which gave images under the influence of the camera, and these images were fixed by immersion in a strong solution of salt and water, in which the unaltered parts of the chloride of silver were soluble. This process was not very sensitive and was set aside by Talbot’s 1840 discovery called the Calotype process. Paper was impregnated with silver iodide, and just before exposure bathed in gallic acid and silver nitrate. A barely visible picture could be developed later by treatment with more gallic acid and silver nitrate in solution. Talbot thus discovered the latent image and chemical development. The paper was fixed in hypo solution. Talbot’s process gave negative pictures which were copied by contact onto paper sensitized with salt and silver nitrate to make positive prints. Calotype, later called Talbotype was the ancestor of modern photography. As discussed later this technique was suggested for applying photographs on unglazed porcelain plates. In the spring of 1839 Mungo Ponton discovered that solutions of potassium dichromate spread on paper were light sensitive. Those parts exposed to sunlight were hardened while the protected parts could be dissolved away with water, leaving the image of the object white upon an orange ground, and quite permanent. Whether Ponton knew it or not, the sensitivity of chromates had in fact been observed in 1832 by Gustav Suckow in 1840 [ 8 ], Edmond Becquerel discovered the process was a reaction of the dichromate on the size in the paper which was starch. Other organic substances such as gum, glue, albumen, gelatin, and sugar could be used instead of starch. The importance of the process was not recognized at the time. It was the fundamental basis for many future photomechanical and photographic processes, including one of the popular methods used today for making enamel photographs. The earliest suggestion for photographs on porcelain came from Fox Talbot and Thomas Malone, who took out a joint patent in December 1849. Unglazed porcelain plates were to be coated with a substratum of albumen and then with the usual calotype sensitive coating on which a calotype negative was to be printed [ 9 ]. There is no evidence that the process was actually used. Apparently the patent did not call for the photographs to be fired. The purpose of the porcelain plate was to provide a material less perishable than paper. In 1851 Scott Archer introduced the Collodion process [ 10 ]. Archer dissolved potassium iodide and bromide in collodion, first made by J.P. Maynard in 1847 by dissolving nitro cotton (gun cotton) in alcohol and ether. This mixture was coated on glass plates and sensitized immediately before exposure by bathing in silver nitrate solution. The plates were exposed wet, then developed at once in a solution of pyrogallol and silver nitrate and fixed in hypo. Despite the tedious procedures this was the standard method used by most photographers for the next 30 years. Collodion positives were used in producing enamel photography a few years later. The first to recognize the necessity of firing the image in a furnace or kiln to fix it permanently to enamel or porcelain were two French photographers, Bulot and Cattin. Their method of fixing, vitrifying, and coloring photographic images taken by Collodion process (which had been transferred) upon enamel, metal, stone, porcelain, glass, china, and all kinds of earthen ware was patented in England on December 13, 1854. Their pictures were to be fired in a furnace after they had been colored, if so desired [ 11 ]. 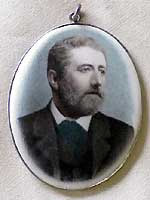 The most famous of the comparatively few producers of enamel photographs was Lafond de Camarsac (1821-1905), a Parisian photographer who brought photographic enamel miniatures to perfection, rivalling the finest ceramic paintings. They were compared with Sèvres porcelain paintings, and earned him a gold medal at the International Exhibition in Paris, 1867. It was then said his total output to date was no fewer than 15,000 enamel photographs [ 12 ]. On June 11, 1855, de Camarsac described two processes to the Academie des Sciences. For monochrome photos he made a collodion positive portrait on glass, toned it with gold or platinum chloride (to eliminate the yellow stain produced by silver), stripped it from its support and carefully transferred it to the slightly curved enameled copper plate. The picture was fired to destroy the collodion film and burn-in the image. A thin layer of flux was fired on top of the picture. For colored enamel photographs he coated a white enameled copper plate with a solution of bitumen of Judea and turpentine, with the addition of black resin. He then laid-on the stripped collodion film and exposed. After dissolving the unchanged bitumen, the whole picture was colored by applying with a fine brush various vitrifiable pigments. The plate was gently heated and then fired to fix permanently the colors. Alphonse Louis Poitevin conceived the idea of applying the dichromate process to the production of permanent prints, as well as to photolithography. In August 1855 he patented his first carbon process. He mixed powdered carbon in dichromated gelatin (or gum or other similar substances), spread it on paper, exposed it under a negative, and after washing, there remained a picture formed by the pigment contained in the insoluble parts of the gelatin, the thickness varying according to the density of the different parts of the negative. The pictures possessed deep blacks and masses of white without half tones. The problem was solved some nine years later and modified for application on enamel and glaze surfaces. A step by step procedure will be described later in this series. A peculiar photochemical reaction of iron salts was discovered in 1858 by Henri Garnier and Alphonse Salmon [ 13 ]. They observed that ferric citrate, exposed to light, changes its solubility and hygroscopic properties. They based on this the first dusting-on process, with which they produced prints on paper and on glass (apparently not fired-in). They stated that ferric citrate showed less solubility in water, or in water containing alcohol or glycerine, in the parts affected by light. The print was dusted with pine soot or other colored dry powder which adhered only to the unexposed tacky portions. The image was fixed by rinsing in water, during which the iron salt dissolved and the dusted-on powder adhered rather well to the paper. Finally, this carbon image was coated with a rubber solution. In 1860 Poitevin invented a second carbon process [ 14 ]. He made use of the hygroscopic property given by light to a coating of perchloride of iron and tartaric acid. If such a coating was exposed through a negative and powdered carbon (or other permanent pigment) then brushed on, it would adhere to those parts which had become sticky by exposure to light, in proportion to the action of light and consequent degree of stickiness. The image was then covered with a layer of collodion and soaked in water, until it detached from the unpolished glass on which it had been formed and was transferred to a sheet of paper. This carbon process gave excellent halftones. After the publication of Poitevin’s second carbon process de Camarsac is said to have changed over to this [ 15 ]. The picture was transferred from a glass plate on which it had been formed; onto the enamel surface to be fired in. Several photographers, licensed or unlicensed, employed Poitevin’s method. One of his licensees was Mathieu Deroche of Paris (later of Milan) whose firm made colored enamel portraits until the turn of century. De Camarsac and Deroche were the best known specialists in this kind of work and executed orders for French and foreign photographers. Their enamel pictures were usually inscribed on the back: “Procédé Lafond de Camarsac (or Procédé Deroche)” with the name of the photographer who took the original portrait, the town, the date of the photograph, and the serial number. Two Deroche portraits are shown on this page. The photograph on the right shows the back with the inscribed details. F. Joubert, a French engraver living in London, took out a patent in January 1860 for a method of coating glass with ammonium dichromate, albumen and honey; when dry, a picture was printed on it from a transparent positive [ 16 ]. The image was brought out by brushing over with powdered enamel color, which stuck only to the parts which had not been exposed to light and remained sticky. The picture was fixed with alcohol containing a little nitric or acetic acid, and washed in water until nothing remained on the glass but the enamel color. It was then fired in the furnace. He produced both black and white and hand tinted pictures using vitreous colors. He produced glass pictures as large as 24″ x 17œ”. We will describe, in detail, a similar process. Poitevin’s first carbon process was improved and patented by J.W. Swan in 1864 [ 17 ]. In 1866 a ready made carbon tissue was marketed. This carbon tissue consisted of a film of gelatin, in which finely powered carbon was incorporated, spread on paper. The tissue was sensitized by the photographer with a solution of potassium dichromate and, when dry, exposed under a negative. The face of the carbon tissue was then attached to a paper support and soaked in hot water until the original backing paper of the carbon tissue could be detached, and the soluble gelatin was dissolved. As the picture was laterally reversed it had to be transferred a second time to its final support. The English patent rights were acquired by the Autotype Printing and Publishing Company in London, in January 1868. Various pigments other than carbon were incorporated in the gelatin enabling the production of color prints in conjunction with separation negatives. A ceramic tissue was made by incorporating ceramic pigments in the gelatin. Both the carbon tissue for paper prints, and the ceramic tissue for photographs on enamel and glazed surfaces were sold well into the middle of the 20th century. The writer still has a few sheets of ceramic tissue purchased in 1949. We will describe how to make and use the tissue in this series. 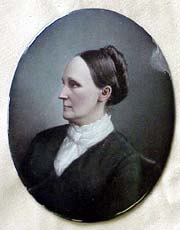 In 1871 R.L. Maddox took the first step in an effort to produce satisfactory dry plates. He prepared suspensions of sensitive silver salts in a gelatin solution which could be coated and satisfactorily dried before use. The roll film system was developed by Eastman and Walker in 1883. The impact of this development on photography is well known. In 1893 J.A. Dedouch of Chicago, Illinois established his company to produce and market enamel photographs. Today, under third generation management, the company located in Oak Park, Illinois continues to grow. Apparently Mr. Dedouch developed his methods independently of European sources. In 1946 John Stola, a long time employee of J.A. Dedouch company (part owner and general manager), formed Oak Park Ceramic Studios. The company, under second generation management, operates under the name of Oak Park Ceramic Company in 15 Hillside Ave., Hillside, IL 60162 (tel. 708-449-5158). 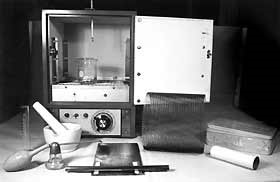 DICHROMATE DUSTING METHOD – part 1The most frequently described method of making enamel photographs is the dichromate dusting method. As mentioned above Gustav Suckow observed the sensitivity of chromates in 1832. In 1839 Mungo Ponton discovered that solutions of potassium dichromate spread on paper were light sensitive. In 1840 Edmond Becquerel discovered the process was a reaction of the dichromate on the size in the paper which was starch. Actually the process depends on the reaction of dichromate with colloids. Colloidal solutions of gum, glue, albumen, gelatin, sugar, dextrine, and others have been used. Under the action of light, dichromate decomposes to form the trivalent chromium compound which has a separating action on the colloidal particles, removing the water from them. Under these conditions, the colloids lose their hygroscopic properties and their colloidal capacity for swelling. In 1948 the writer acquired D.M. Campana’s “Recipies For Ceramic Photography” [ 18 ]. The traditional 19th century method was given for the dichromate dusting method. This involved a transfer using collodion which appeared to be quite tedious. A modification was developed, eliminating the transfer, thus simplifying the technique. In 1979 the writer became familiar with Joubert’s patent of 1860 for photographs on glass. The two methods are practically identical. Following is a step by step description of this simplified method. To keep the instructions as uncluttered as possible our discussion of each step will be held to a minimum. Comments and refinements of each step will be discussed in the next chapter. A full size transparent positive image is required for this method. It is made from a negative in the same manner as an enlarged print. Instead of placing enlarging paper in the easel of the enlarger use cut or sheet film. We use Kodalith ortho (Type 3). Such film is obtainable from graphic arts, lithographic or screen printing suppliers. Many of these suppliers will make transparent positives from your negatives, or from ordinary photographs. Readers familiar with making enlarged prints should have little trouble making their own transparent positives. The transparent positive should have at least average contrast and density. Use flat copper with white enamel. We recommend starting with a small piece about 2 x 2¾ (5.1 x 6.9 cm) and increasing the size as proficiency is acquired. Both AW-1 and 621-A white enamels are suitable. Best results are obtained when the enamel is ground or milled with clay, water, and electrolytes to form a liquid suitable for spraying. Apply one medium or two light coats on both sides. Both sides are coated, dried and fired at the same time. Do not apply enamel to one side, dry, fire and then enamel the other side – it will warp. The enamel must be fired to a smooth surface, without orange-peel, and have no blisters, pin holes, fire scale or other blemishes. And the plaque must be flat. The enameled plaque must be carefully cleaned prior to applying the sensitizer. Our method is to scour the plaque with comet or other cleanser, and rinse in warm running water. Place into a solution of ammonia and water (40 ml household ammonia, 100 ml warm water) and leave for about 10 minutes. Remove, rinse in warm running water, and dry with a paper towel. Finally heat in a furnace at 600 °F (315 °C) for 10 minutes. When cool store them in a dust free area. 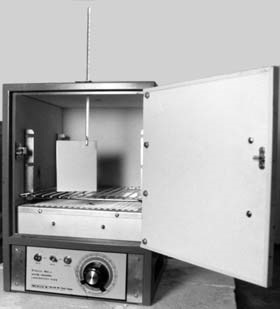 We use a laboratory oven as shown in Fig. 2. The plaques are stood on edge and leaned against the wall of the oven. All ingredients, except the gum*, are easily dissolved. Solution #1 should be made, at least, four hours prior to the time it is to be used. First add the sugar to the water and agitate until dissolved. Then add the gum, a little at a time and agitate so the gum gets wet and sinks to the bottom. After the gum is dissolved the solution should be filtered at least twice. We use a Buchner funnel as shown in Fig. 3. A vacuum is drawn with an aspirator, also shown in Fig. 3. Both are obtainable from laboratory supply dealers. An alternate method is to use a piece of nylon stocking material. Both solutions should be stored separately in glass or plastic containers. Theoretically both can be stored in daylight, however we keep solution #2 in a desk drawer and expose it only to subdued light. * I recommend a few drops of wintergreen oil (methyl salicylate) be added to all recipies containing gum arabic. Some times it will deteriorate quite quickly. I am not sure of the cause. The defect is ugly dark specks. After the solutions are mixed we do not expose the mixture to bright light. On occasions we have mixed them in subdued light without any apparent problems, however normally it is done under safelight conditions. We use a yellow safelight, Wratten Series OA filter, with a 15 watt lamp. The sensitizer is made by adding 10 ml of solution #2 to solution #1. It is a good practice to filter the mixture at least once. We prefer to make solution #1 fresh each day, while solution #2 is stored for a period of time. Balance the plaque on the left fingers and hold it as horizontal as possible. Pour the sensitizer onto the center of the plaque and maneuver it so it spreads over the entire surface. 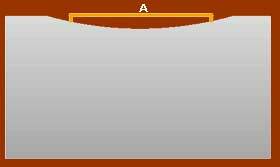 We allow the solution to move first to the outer left corner, to the outer right, back along the right edge to the near right, and finally to the near left corner. It may be necessary to pour a little more sensitizer onto the plaque a time or two during this maneuver when coating a sizable plaque. Raise the plaque to near vertical position, allowing the excess solution to run off. Inspect the plaque closely at this stage. If there are bubbles or other imperfections recoat immediately. If the problem persists the plaque should be recleaned. The sensitizer should be poured from a beaker or other type glass ware having a good pouring spout when coating the plaque. Pouring from a jelly glass is not very ideal. When the coating is satisfactory the plaque should be dried at a temperature no higher than 110 °F (43 °C). When placed in a laboratory oven at 100 °F (38 °C) about 10-15 minutes is required. No doubt a hair dryer could be blown on the back side of the plaque if an oven is not available. In any case the plaque should be kept in a near vertical position throughout the drying. When dry the coating is light sensitive and must be handled under safelight conditions. The application and drying of the sensitizer should be in an area as dust free as possible. Perhaps the greatest problem in the entire process is dust. When dry the sensitizer is a light lemon yellow color. If brown it was dried at a temperature which was too high. The normal contact printing frame used by photographers works quite well. Place the transparent positive, glossy side down, into the frame. The dry sensitized plaque is laid face down, on top of the transparent positive. The sensitized surface is in contact with the emulsion side of the transparent positive. Carefully close the printing frame. Since the enameled plaque is thicker than the print paper normally used in the printing frame the glass in the printing frame can be easily broken. Lay the printing frame flat on a horizontal surface under a light source. We use a 500 watt photo flood in a 12″ (30.5 cm) reflector, covered with a Lexan diffusion screen. The distance from the bulb to the printing frame is 24 inches (61 cm). Exposure time depends on the density of the transparent positive, thickness of the sensitizer coating, and to some extent the opacity of the white enamel. We find the proper length of exposure usually falls between 5 and 10 minutes. When the plaque is removed from the printing frame, following the exposure, a faint image should be seen on the sensitized surface. The image appears as a negative, that is, the dark areas correspond to the light areas of the transparent positive and vice versa. The exposed sensitizer requires some time to pick up moisture. The exposed sensitizer will pick up moisture in inverse proportion to the amount of exposure. A suitable length of aging is normally 3 to 5 minutes. This must be done under the safelight. The picture is developed by dusting the sensitized surface with a black ceramic pigment also sometimes called oxide. Place the pigment into a shallow container such as a watch glass. A cotton pad about one and one half inches in diameter is dabbed into the pigment until a reasonable amount is picked up. The pigment is applied to the entire surface of the plaque by moving the cotton pad in a series of small circles. Use plenty of pigment and barely touch the surface as the cotton pad moves over the entire image. When the finest details show distinctly and the density seems sufficient in the darker shade areas the development is complete. All superfluous pigment is removed with a large pad of cotton. Slight pressure may be used at this time. Dusting is the last operation that has to be done under the safelight. If the entire image picks up pigment and has a smeary appearance it-is a sign of under exposure. If the image does not pick up a sufficient amount of pigment it is a sign of over exposure. The amount of pigment picked up is also directly proportional to the length of aging. However, length of aging can not compensate for sizable errors in exposure time. The unreacted dichromate must be removed to prevent a yellow color when the image is fired. This is accomplished by washing the plaque in water. However, the image is too weak to withstand washing immediately after the dusting operation. Leave the image exposed to normal room light for 20-24 hours. During this time the image continues to harden, but the excess dichromate remains soluble in water. Carefully place the plaque face up into a pan of cool water. Ten to fifteen minutes is usually sufficient to remove any visible yellow stain. Carefully remove the plaque and stand it in a near vertical position to dry. We permit the plaque to air dry 20-24 hours prior to firing. This length of drying may not be necessary. We have never tried to determine whether or not a shorter drying cycle is permissible. Place the plaque onto a preheated trivet, hold just inside the furnace for 20-30 seconds and then place into the furnace for 2 minutes at about 1350 °F (732 °C). Remove trivet from the furnace and allow the plaque to cool on the trivet. DICHROMATE DUSTING METHOD – part 2We so far described the basic steps to produce a photograph on an enamel surface by the dichromate dusting process. The discussion of each step was held to a minimum to keep the article as simple as possible. Considerable information is available in literature but it is difficult to find. Much of it has been out of print for almost 100 years. Some older information is of historical interest only, but we feel justified in reprinting certain items for the benefit of readers interested in how things were accomplished in earlier times. Other information describes important refinements of the various steps in the process which are as valid today as when published. We will present the information, taken from various sources, in a step by step order, much as the process was described in our previous article. Enameled plaques. We recommended a flat rectangular plaque because it presents less problems for the beginner. The traditional plaques used during the past 130 years have been oval, rectangular or round shapes, all slightly domed. Present practice is to mechanically stamp a slightly domed shape using copper approximately 0.028″ (0.7 mm) in thickness. Occasionally enameling iron or stainless steel is used. A thick, approximately 0.025 (0.64 mm), of a medium opaque white is applied to both sides by spraying or dipping. Usually the plaques range in size from 2″ x 3″ (5.1 x 7.6 cm) to 5″ x 7″ (12.7 x 17.8 cm), however a few are made as large as 8″ x 10″ (5 x 7.5 cm to 20 x 25 cm). “While upon this subject we cannot do better than quote freely from an excellent report of a practical demonstration of the preparation of enamelled plaques, given by Mr. A. Haddon before the London and Provincial Photographic Association. In this operation the plaque gets more or less bent, so that when laid with its edge upon a flat table it will touch the table, but at three points instead of all round the edge; while, however, upon the flat surface, it can easily be bent right by the aid of a spatula. “The plaque has next to be ‘pickled’ to remove oxide. This is done in a 20 per cent mixture of sulphuric acid, with water; this clearing had better continue for three hours, and until shortly before the copper is covered with enamel. If the plaque is wanted at once it should not be pickled cold, but the diluted acid in which it is placed should be raised to the boiling point for one minute, after which it is washed in cold water, then wiped dry with a clean rag. If not to be used at once, it should be placed in perfectly dry sawdust; there is then nothing to do but to brush off the dust before use. The excess of water is now poured off the enamel in the two vessels; the little copper tray is placed with its concave surface upwards on some concave support, and then the application of the enamel begins. The enamel is in two grades, coarse and fine, and ought to be applied with a hogshair brush. The enamel must be so far deprived of water as to be creamy; if it is too thick it cannot be spread properly. A little enamel may be put on the copper surface and then rubbed over it with a finger, then with the brush the proper quantity can be spread over pretty uniformly; this is assisted by putting the copper tray on a wooden support, and gently tapping the latter upon the table. The washed fine enamel powder has to be put on the concave surface of the copper, not the coarse enamel. The water in the enamel has next to be got rid of. At first he used nothing but blotting-paper for the purpose, but he preferred a few folds of old linen upon a tray; with the copper oval and its wet enamel placed between the folds, at once a large portion of moisture is absorbed, and in time the bulk of the free water is taken up. When nearly dry, and not too dry or too wet, the enamel must be more finely spread by means of a highly-burnished spatula; unless the enamel be in the proper hygroscopic state, it is not possible thus to spread it uniformly. “The backs having been thus coated, it is now necessary to coat the fronts. A small quantity of the washed coarse enamel is spread over the surface, and then brought down to the rounded turned-up edge of the copper. It is difficult to spread it when charged with too much water, for it then drags under the spatula, and uniformity of surface cannot be obtained, but by tapping it and its supporting wooden block upon the table, the surface of the enamel becomes smooth. The moisture is removed by linen as before, and it is left under linen until it is dry enough to be spread by a spatula. The steel spatula used might have been about six or seven inches in length; its shape is represented in Fig. 18; the curve of its edge AK had a radius of four inches, and the curve of the edge HK had a radius of five inches. Next the whole of the moisture has to be driven off. Where many plaques have to be dried at one time it may be well to provide near the muffle a large cupboard, in which cupboard they can be dried in warm air. He had found it sufficient to place them on a sheet of copper with the small flame of a Bunsen’s burner underneath; after being so treated for ten minutes they are dry enough for firing. When all the moisture has been driven off, the particles of powder on the upper and lower surface of the copper are simply wedged together, and the slightest touch is liable to make the powder get loose, so the plaques at this stage must be moved only with the greatest care. They have to be placed upon a suitable support for firing; they are sometimes made to rest upon hard earthenware, which will stand the heat. As the enamel might stick to the earthenware, the latter is usually covered with rouge or kaolin. When the plaque is inserted in the muffle, the whole is raised to a cherry red heat. Oxide of copper is then thrown off from the exposed edge of the plaque, and precautions have to be taken to prevent this falling on the face of the enamel; the inside of the muffle is therefore, before the firing, smeared with ordinary red lead and water; under the heat, it forms a kind of glaze to which whatever flies to it sticks. The plaque must not be put suddenly into the muffle or the heat may suddenly transform into steam any traces of moisture present, thereby causing the displacement of particles of enamel, for not alone would one plaque be thus destroyed, but some of the others in the muffle on which the freed particles descended. The plaque, having been introduced gently into the muffle gradually acquires a surface like a ploughed field; this is due to incipient fusion; next there is a gradual coalescence until the surface is smooth. Should the temperature not be sufficiently high the surface will become mottled. If the heat be allowed to act much longer than is absolutely necessary, green coloration begins, due to silicate of copper extending over the enamel. In the muffle the plaque may be turned round upon its support by means of a long piece of thin steel wire, in order to get its different portions in turn over the hottest part; the wire should be long, and it should have a wooden handle for the sake of comfort, the heat being great. In some cases, undulations which can be removed will be found on the finished plaque; in such cases it is necessary to take some powdered flagstone wherewith to grind down the surface by the aid of a piece of wood; the powder should be mixed with water, the plaque should rest upon several thicknesses of calico, and the grinding should be continued until the whole surface is mat. Specks should then be removed and the plaque re-fired. Lead does not answer for this grinding so well as wood. By rubbing the surface with a piece of pumice-stone, the flagstone powder is removed. After the firing, any specks on the enamel have to be removed. This is done by means of a length of square steel, measuring one-tenth of an inch on each side, filed down at the end to a pyramid. The specks must not be removed by digging into the enamel; the tool is held nearly parallel to the surface of the plaque, and the surface of the enamel at the place of the defect is scraped horizontally. Plaque makers thus remove the enamel right down to the copper, without removing any of the copper itself; the holes thus made are filled up with fresh enamel, by means of a spatula made of copper wire, and the plaque is re-fired. Hitherto there have been no standard sizes of plaques; each maker made a different series. By the courtesy of Penrose & Co., the English manufacturers of first quality plaques, we are enabled to give diagrams of the actual standard oval and rectangular sizes (Fig. 19 and 20); by means of these diagrams, workers can ascertain at once the size best suited to their purpose. Circular plaques (Fig. 21) will also be supplied in several sizes by the same firm. We can not resist commenting on certain parts of the above extract. This is the only reference we have seen that enamel was sold in thin slabs cast on sand. Perhaps certain colors were processed in some manner to give this appearance. We question the general use of the process as described. This is also the only reference we have seen using a wooden mortar to grind enamel. It does not appear to be feasible. However, a trial showed it is fairly practical, especially if used for a single color. Pounding or crushing by impact was more effective than circular grinding motions. Washing was necessary to remove the small particles of wood. The fired enamel was clean and of normal quality. We question the use of cold 20% sulphuric acid for three hours, and also its use at boiling for one minute. Boiling 20% sulphuric gives off some very noxious fumes. The same strength of nitric at room temperature is far superior for pickling copper. We most definitely do not recommend coating the inside of the muffle with red lead and water. This could be very hazardous to ones health. The green discoloration is due to the enamel taking copper oxide into solution, rather than silicate of copper extending over the enamel. The two Deroche pictures shown earlier are on copper plaques apparently made as described above. They are 4″ x 53/16″ (10.16 x 13.18 cm) ovals, 0.012″ (0.3 mm) thick with a turned rim about 0.012″ (0.3 mm) in height. Approximately 0.038″ (1 mm) enamel was applied to the front and about 0.005″ (0.13 mm) to the reverse side. The total thickness of enamel is 3.58 times the thickness of the metal. Perhaps the plaque should be referred to as a sheet of enamel with a piece of copper foil embedded near the bottom surface. The result is an enamel-metal composite where the metal puts very little strain on the enamel. On refiring there is very little tendency to hair-line. Rather than use earthenware covered with rouge or kaolin as a support for firing we would use the support shown in Fig. 4. The fixture consists of a sheet of stainless steel with flanges turned on two edges. Small pieces of Ceramic paper are strategically placed to support the plaque and to prevent its sticking to the stainless steel. The stainless steel fixture is setting on top of two inconel bars which have a triangular cross section. These two bars are normally laying on the bottom of the furnace. They have been removed for ease in photographing. The stainless steel fixture is preheated for a minute or more, removed, and the enameled plaque carefully placed onto the fixture using a spatula. The fixture is then placed into the furnace where it sets on the triangle bars. The triangle bars serve two purposes. First they retain some heat when the door is opened. Second they raise the firing fixture so all parts get a better look at the heating elements, and thermal currents can circulate underneath. We suspect the reporter either failed to observe or forgot to report the use of gum in the wet enamel, especially that which was used on the back of the plaque. Transparent positiveThe first step is to obtain a negative. It may be a snap shot or from a camera used to copy a photograph. The negative can be retouched as necessary. From this retouched negative the transparent positive is made. This is done with the enlarger normally used by photographers. The size of the image in the transparent positive is the size of the final image on the enamel surface. The positive may undergo further retouching prior to its use in the exposure of the sensitized enamel surface. When a flat enameled plaque is being used most any type film is suitable for making the transparent positive. However, when the plaque has a slight dome the transparent positive must have some flexibility in order to conform to the shape of the plaque. We have had good results with Kodalith Ortho, Type 3 which is about 0.0055″ (0.14 mm) in thickness. Thin film is desirable and acetate base is better than estar base. We have never tried stripping film, however it is quite thin and might be very suitable. Figure 5 shows a home made gadget which provides some assistance. The gadget consists of two pieces of plywood. One piece, the base, is solid while the top piece has a cut out the exact size of the intended image. The transparent positive is taped to the underneath side of the to piece and the enameled plaque is placed face-up onto this solid base. The two pieces of wood are assembled as show in Fig. 6. The plaque must not be warped and it must have a uniform dome. The inner edge of the “cut out” in the top wood piece must be such that a uniform pressure is applied to the film. That is, no nicks, bumps, or other blemishes can be tolerated. This cut out must be of a size such that the pressure is on what might be called the knuckle radius of the plaque. In other words this oval cut out is slightly smaller than the plaque. Exposure is made directly through the transparent positive without a glass cover. Production studios would build such gadgets of metal and of a design which would require less time to operate. The above suggestions do not produce miracles. This amount of dome permissible in the enamel plaque is definitely limited. Photographic film was developed in the 1880’s. Prior to this the best thing available for making negatives and transparent positives was a glass plate. It was difficult to obtain close contact between a glass plate and an enamel surface. It was impossible to make the glass plate conform to a domed shape. Nineteenth century producers of enamel photography handled this problem by using a transfer. A glass plate was sensitized in the same manner we described for sensitizing an enamel plaque. It was exposed through a glass positive, and then dusted with a ceramic pigment. The dusted surface was flooded with Collodion. After the Collodion “set” the plate was placed into water to remove the excess dichromate. The collodion was then stripped from the glass plate and transferred to the enameled plaque. For historical reasons we present the following extract from “Photo Ceramics” [ 20 ]. “We have mentioned glibly enough that the film must be coated with collodion, but in all probability many who will read this book have never used collodion in their lives; we therefore give one or two hints on its application. Hold the plate between the first finger and thumb of the left hand by the lower left-hand corner, taking care to hold it as nearly level as possible. Then pour a pool of collodion in the centre of the plate and incline it so that the liquid flows towards the top right-hand corner, then towards the top left corner, then towards the lower left corner just missing the thumb), and finally pour off at the lower righthand corner into another bottle. The collodion must be flowed quickly, yet without undue haste, otherwise it will set in streaks and ruin the transfer. Directly the surplus has run off the plate the student will notice streaks and lines begin to form diagonally from the top left towards the bottom right-hand corner. These can be dissipated by deliberately rocking the plate edgewise from left to right and right to left. As the beauty of the transfer depends upon many trifling things, we advise the student to practice coating plain glass until he can do it properly with some degree of certainty. A few trials will achieve this. As soon as the surface of the plate appears uniformly even, the film is probably set; to make sure of this it is well to touch the bottom of it with the tip of a finger. If the film remains unbroken, it is sufficiently set to be put into the decolorizing bath. In all the foreign works on the subject we have found various chemicals suggested for the purpose of removing the yellowness of the bichromate, which, if allowed to remain, would irretrievably ruin the pureness of the result. Among the many things suggested are sulphuric acid, nitric acid, hydrochloric acid, and caustic potash. In very obstinate cases of discoloration the film may be immersed for fifteen minutes in a weak solution of sulphuric acid (say five per cent), but it is absolutely necessary that all trace of acid be afterwards removed. It must also be borne in mind that acids have a deleterious effect upon many colors. In all our exhaustive experiments we have found the best bath for removing the bulk of the bichromate to be pure water. The water should be filtered (although this is not absolutely necessary with the first two baths), and the plate must remain in it for at least fifteen minutes, and then removed to another tray of filtered water for a further fifteen minutes. The film must next be placed in a bath of fused borax solution (prepared as recommended for transfers), where it must remain about ten minutes. After immersion in a third bath of filtered water for ten minutes the film will be ready for transfer. Several films (as many as the trays will accommodate) may be washed at once, but there must be plenty of water in the baths, and it must be frequently changed. The mixture may be used several times, but must be filtered each time. The fused borax is almost insoluble in cold water, so the best plan is to have a few ounces crushed to powder and boil it in a tin or enamelled saucepan with about a pint of water at a time. It should be boiled at a gallop for about five minutes and stirred all the time. Then pour off the solution and add more water, and repeat the operation until all is dissolved. When cool, the surplus fused borax will deposit crystals in the bottle; these can be re-dissolved when required. It is advisable to keep a plentiful supply of this solution on hand, as it is practically invaluable. It serves several purposes; it not only discharges any remnants of bichromate that may be lurking in the film, but it binds the collodion firmly to the final support (after transfer) and prevents all inclination to blistering when submitted to the fire. Before making the transfer, the edges of the collodion film must be released from the glass. It is best to do this with a sharp penknife pressed downwards directly through the film to the glass. On no account must the blade be dragged through the film, or the latter will pucker up and be rendered useless. A series of stabs through the film will soon free it from its support; the glass may then be placed in the basin of fused borax solution. The film will float from the glass (which may then be removed from the basin), and must be turned over so that the collodion side is downward, and the powder side (which was in contact with the glass) upward. The film may be easily turned by the help of a camelhair brush about the size of a goose quill. Great care must be observed when touching the powder side of the film, or the color will be dislodged – if the film itself is not actually broken. We advise beginners to touch only the extreme edges while turning the film, and on no account to touch the film with fingers – or a disaster may be confidently expected. As soon as the film is free, the plaque and a support (a small block of china or glass, to raise it off the bottom of the basin) may be put into the basin. If the basin is at all small, it is best to put in the plaque and its support before introducing the film and so avoid all risks. When all is ready for the transfer, plunge the left hand into the solution and hold the support between the first and middle fingers, gradually raising the plaque. Meantime, with the camel-hair pencil, manipulate the floating film until it occupies the correct position upon the plaque. The centre of the plaque may be raised slightly above the level of the liquid, but it must not be raised entirely from it until the film is in absolutely correct position. So long as the ends of the film remain in the solution, it may be moved freely, but directly they leave the solution they cleave to the lower side of the plaque and the transfer is complete. If the film is wrinkled at all near the edges (although it is not likely to be), it may be gently drawn into position by lightly dragging the thumb downwards over the extreme edge of the plaque. Do not touch the top surface of the image, or the powder will come away and the transfer be rendered useless. The plaque must be lifted from its support by means of a spatula and placed upon a few sheets of blotting paper until dry. The ends of the film may then be removed from the back with a moistened rag, which will give it a clean and finished appearance. Actually the transfer using collodion is not as difficult as it sounds, however collodion must be handled with care. It consists of gun cotton dissolved in a mixture of ether and alcohol. It is highly inflammable and due to the ether, it must be used with adequate ventilation. It is far safer and easier to use the flexible film available today. DICHROMATE DUSTING METHOD – part 3We compared today’s method of producing enameled plaques to that of approximately 100 years ago. We also described the use of glass plates for the transparent positive which necessitated a transfer using collodion. Approximately 100 years ago flexible film became available, making the transfer unnecessary. To the writers knowledge, the use of flexible film in making enamel photographs to eliminate the collodion transfer had never been described in writing prior to 1985 (Glass on Metal, vol. 4, #5). We will continue presenting information, taken from various sources, for the remaining steps of the process. sugar = 7.5/17 = 44.1%; gum = 7.5/17 = 44.1%; dichromate = 2.0/17 = 11.8%. Mix the two solutions in equal proportions. Mix 100 parts by weight of solution #1 and 25 parts of solution #2 the day before use. The filtered mixture should be stored in the dark. Mix equal parts and filter. Other formulas contain clarified egg albumin, glycerin, gelatin, white glue, manna iluta, etc. We have not seen a formula containing starch which was the responsible colloid for the original discovery by Ponton in 1839. We suggested earlier the sensitizer be made up fresh each day. This may be required in Summer. In Winter, or if a refrigerator is available, the sensitizer can be kept for a week or more. The technique of coating and drying the sensitized plaque described earlier is suitable for a flat plaque especially if the plaque has a slight warp or a slight orange-peel. A plaque with a slight dome is handled somewhat differently. Balance the face up plaque horizontally on the finger tips, pour the sensitizer onto the center and manipulate the plaque so the sensitizer flows evenly. Lay the plaque in a horizontal position in the dryer. The dryer shelf must be level. As mentioned earlier exposure to light causes a chemical change which reduces the colloid’s ability to take up moisture, thus reducing the amount of powder picked up during the dusting process. The same chemical change takes place when the dry sensitizer is heated. Actually the chemical change proceeds slowly at room temperature after the sensitizer becomes dry. Thus the plaque should be exposed soon after becoming dry. Alternatively dry plaques can be stored in a refrigerator which slows down the chemical reaction. The sensitizer is affected by the ultraviolet part of the spectrum. Therefore a light source high in ultraviolet is desirable, such as carbon arc, mercury vapor lamp, sun lamp, quartz lamp, or direct sunlight. Less effective is the photoflood bulb used as a flood light by photographers. However, this type bulb is more easily obtained and is satisfactory for occasional work. We normally use, a plastic diffuser on the reflector to distribute the light, however this is not an absolute requirement. This is our term for the waiting period between the end of exposure and the beginning of the dusting process. Some of the older literature recommends placing the exposed plaque back into the dryer for a period of time. Apparently this was because on an overcast day the exposure to the sun would require 30 minutes or more. During this time the less exposed areas would be picking up moisture and if dusted with oxide immediately after exposure these areas might pick up too much oxide. By returning the plaque to the dryer and removing the moisture it was possible to then subject the dry plaque to the atmosphere and determine the length of time required to pick up sufficient moisture. Thus, more control was obtained for this part of the process. We do not find it necessary to return the plaque to the dryer after exposure to artificial light. It appears an aging of 3 to 5 minutes is desirable. The exposure time is adjusted to permit this. A longer exposure time permits longer aging. We recommend the use of a cotton pad to distribute the pigment over the plaque to develop the image. A soft brush can be used to pick the pigment up from a small flat container and distribute it over the plaque. We prefer to use a black ceramic pigment. Finely ground black enamel can also be used. In this case extra black pigment is added to increase the strength of the color. The mixture can be used in this form or sintered to combine the enamel and pigment and then reground. The exposed and aged plaque will not retain the finely ground enamel as readily as the ceramic pigment. To overcome this, a drop or two of glycerin is added to the sensitizer if the plaque is to be dusted with enamel. Adding glycerin is quite effective and care must be used to keep from over doing it. If the plaque is slightly over exposed the plaque may not pick up quite enough oxide, but by carefully breathing on the plaque extra moisture will be absorbed and additional powder will be retained. It is difficult to distribute the breath evenly over the plaque to prevent the powder being picked up in splotches. Splotches can be reduced by sprinkling some 80 mesh enamel on the area and using the cotton pad to gently scrub the area. However, it is usually best to wash off the plaque and start over. If the photo is to be painted in natural colors the plaque is dusted with a sepia or warm brown rather than black powder. The length of time between the dusting and washing operations will vary from time to time. The image appears to be less fragile after dusting if more gum arabic is added to the sensitizer. The fragility of the image may vary with the atmospheric temperature. On occasions we have been able to wash the image within 30 minutes after dusting. On other occasions the image lost adherence when washed 3 or 4 hours after being dusted. Consequently we have formed the habit of waiting 20 to 24 hours. No doubt anyone interested in producing photos on a production basis would be able to establish a system which would permit washing with a shorter lapse of time than 20 to 24 hours. We have found 15 minutes in room temperature water is sufficient to remove all traces of the yellow color from the image. Several references recommend 3 or 4 changes of water, others recommend a borax solution, while others recommend a weak acid solution to remove the last traces of yellow. We suspect in these instances a higher percentage of dichromate was used compared to our formula. When the image is dry it can be touched up. Black specks can be removed with a sharp pointed instrument using very little pressure and gentle strokes. White spots can be corrected using a small brush to apply a mixture of the black ceramic pigment and turpentine. Mixing the pigment with water does not brush well. Large areas can be corrected using an air brush to spray a suitably thinned mixture of the black ceramic pigment and turpentine. Any part of the image can easily be removed with a paper stump, damp cloth, etc. Thus any part of the background such as a building, automobile, etc. may be easily removed. On the other hand additions can be made to the image. For example, if on the original photograph a man has no coat, one can be retouched onto the image with an air brush. Natural colors can be applied at this time with either an air brush or a hand brush. Colors are mixtures of finely ground enamel, ceramic pigments and turpentine. The extent of touching up depends on the painting ability of the enameler. For more information on the technique of spraying see Glass on Metal volume 2 #6, pages 67-70. FiringWe recommend the firing support shown in Figure 4 if one or two plaques are to be fired at a time. For production runs, where several plaques are to be fired at the same time, special firing racks would be constructed. With most furnaces two minutes at a temperature between 1350-1450 °F (732-788 °C) should be suitable for plaques up to 3½” x 4½” (8.9 x 11.4 cm) in size. Similar to firing decals, over firing will cause the image to sink slightly, however decals are much more sensitive in this respect. The fired plaque can also be touched up and refired as desired. Actually the beginner may wish to change the above routine, by firing the plaque following the removal of any black specks and unwanted parts of the image. The major portion of touch up and application of color can be on the fired surface. Likewise the plaque can be fired after touch up. If a transparent final coat is desired it can be applied and fired separately. There is considerable latitude in the order in which these last three steps are done. In keeping with the times a review of literature concerning the handling of the chemicals making up our recommended formula is in order. Gum arabic carries a “USE CARE” label while both household ammonia and ammonium dichromate carries a “WARNING” label. We suggest reading the labels and following their instructions. dichromatesAt the turn of the Century many photographers used the gum-dichromate printing technique and printers used the photogravure technique – both using ammonium or potassium dichromate. As a result many people were exposed to large amounts of dichromate day after day. In 1905 A.M. Marton [ 24 ] discussed the handling of dichromate. He suggested it not be allowed to touch the hands where there was an abrasion of the skin or a sore of any kind. It causes a severe irritation and retards healing. In a powdered state it must be carefully handled to avoid dust, which, if inhaled, attacks the mucous membrane very seriously, causing a violent cough and sneezing, with a suffusion of tears. Taken internally, it causes violent inflammation of the stomach and bowels, and seriously affects the kidneys and bladder. He stated poisoning by dichromates was very rare. He concluded the safest and best plan, when handling any chemical used in photography, was to wear rubber gloves, or at least rubber finger cots. In 1979 McCann [ 25 ] gives a somewhat similar discussion on the use of potassium dichromate. As dichromates are known to frequently cause skin hypersentistivity, it is strongly recommended to wear suitable gloves when handling this material. ammonium hydroxideMcCann [ 26 ] discusses ammonium hydroxide stating it is moderately corrosive to skin and highly damaging to eyes. Inhalation of vapors can cause severe respiratory irritation and pulmonary edema; vapors are also damaging to the eyes. Ingestion can cause intense pain and damage to mouth and esophagus, and can be fatal. He indicates household ammonia is less hazardous, but gives no hint as to what degree. gum arabicThe label on gum arabic indicates no special precautions are necessary, however handling care generally in keeping with safe laboratory practice is recommended. McCann [ 27 ] cautions that spraying arabic gum solution causes severe respiratory allergies, if inhaled. The quantities of chemicals used, in the processes we have described are quite small and it would take a very inept adult to breathe, swallow or get an appreciable amount on their skin following the procedures outlined. The writer does not wear rubber gloves, however the hands are washed with tap water immediately after sensitizing the plaques. A slight irritation has been noticed when there was a small break in the skin. Even then the only precaution taken was washing the hands. We do not wear goggles or respirators when doing this work, however we have had more than 50 years experience handling chemicals. We do not recommend all readers follow this practice, but leave it to each individual to make their own decision based upon their knowledge and work habits. Under no circumstances should any chemicals be left where children can handle or contact them. This concludes our lengthy review of the dichromate-dusting technique. At the end of the regular references we list additional reading references which we did not quote directly. We now ask for help from any of our readers. Following are references which we have not been able to locate. Information concerning the availability of any of these references, or photocopies of any part would be greatly appreciated. Burnett Burnt-in photography on porcelain, glass, and allied vitreous and ceramic fabrics. Edinburgh, 1857. A single sheet, approximately 9″ x 12”. Garin et Aymar La photographie vitrifiée. Paris, G. Villars, 1890. Geymet Traité pratique des émaux photographiques. 3rd Edition. Paris, Gauthier-villars, 1885, 160 pages. Geymet Traité pratique des céramiques photographiques. Paris, Gauthier-Villars, 1885. Geymet et Alker Émaux photographiques. Traité Pratique, Paris, 1868. Godard, E. Procédés photographiques pour l’application directe sur la porcelaine avec couleurs vitrifiables, de dessins, photographies, etc. Paris, 1888. Kissling, J. Das Gesammtgebiet der Photokeramik. Berlin, 1894. Krüger, J. Die Photokeramik. Wien, Hartleben, 1879. Krüger, J. Die Photokeramik. 2nd Edition. Revised by Prof. J. Husnik, Wien, 1893. Lafond de Camarsac Portraits photographiques sur émail, vitrifiés et inaltérables commes les peintures de Sèvres. Paris 1865. Liesegang, P.E. Photographische Schmeltz Farbenbilder auf Email, Porzellan und Glas. Düsseldorf, 1898. Martin Handbuch der Email Photographie. Weimar, 1862. Mercator, G. Die Photokeramik und ihre limitationen. Halle a. S., 1900. In general, this method is easier than the Gum-Dichromate method described in previous installments. A transparent negative is used rather than a transparent positive. This may be a slight disadvantage in some instances where an enlarged negative is required. As mentioned Garnier and Salmon were the first to report the photochemical reaction of iron salts in 1858. They observed that ferric citrate, exposed to light, changed its solubility and hygroscopic properties. Based upon this, they developed the first dusting-on process. They produced prints on paper and glass (apparently not fired-in). In 1860, Poitevin invented his second carbon process based on the change of the hygroscopic property of ferric iron chloride and tartaric acid when exposed to light. If such a coating was exposed through a negative and powdered carbon (or other permanent pigment) then brushed on, it would adhere to those parts which had become hygroscopic by exposure to light, in proportion to the amount of light transmitted through the negative. We have not seen a reference indicating Poitevin actually fired images on enamel, however, it is stated that Mathieu Deroche was one of his licensees. It is also reported that de Camarsac switched to this method. Even though the process was apparently widely used, we find only three references describing its use [ 28-30 ]. All three are sketchy and very limited in details. In describing this method the same general order used to describe the Gum-Dichromate method will be used. Frequent reference will be made to the steps described in this previous method, where applicable, in order to save space and time. A full size black and white negative is required for this process. This may present a slight problem in that most people use small size film which is used to make enlarged prints. Those who have Speed Graphics or other view back cameras can copy such prints on 4″ x 5″ (10.2 x 12.7 cm) negatives or larger depending on the equipment. An alternate is to make an enlarged transparent positive from the original small negative using ordinary enlarging equipment. Then the enlarged transparent positive can be used to make a full size negative by contact printing. Advanced photographers might simplify this procedure by using reversal film. Most communities of any size should have commercial photographers capable of making the desired size negative. The negative should be a normal one, not a half-tone. If the photo is to be applied to a domed shape, the negative should be as thin as possible and preferably on an acetate base. Kodalith Ortho, type 3 is typical. For this process it is important to use copper plaques. They must be coated with an acid resistant enamel. We recommend our AW-1 for best results. The enamel should be ball milled with clay, water, electrolytes, additional opacifier and applied to both sides by spraying. The enameled plaques should be cleaned with household cleanser, rinsed and placed into a solution of ammonia and water. 40 cc of household ammonia to 100 ml warm water is recommended. After ten minutes, rinse and dry with paper towels. Heat at 600 °F (315 °C) for 10 minutes. When cool, store in a dust free area. To use: Mix equal volumes. Tartaric acid dissolves quickly and completely. Iron chloride usually leaves a residue which does not dissolve, thus it requires filtering. A normal chemical laboratory glass funnel with fast filter paper is suitable. It is good practice to filter the tartaric solution, using another piece of filter paper. Both solutions can be stored in ordinary room light for several weeks. The tartaric acid, being an organic, will deteriorate first forming a mold. Once the solutions are mixed together, the resulting solution should be stored in the dark and exposed only to a yellow safe light. If stored in a dark area, this solution will keep for some time depending on the age of the individual solutions. The concentration of the two solutions is not extremely critical. They can be made twice as strong, mixed in equal parts, and used full strength or diluted with water to produce a range of concentrations. When using the stronger concentration the washing step, mentioned later, will need to be lengthened to remove the yellow discoloration. Flow coat as described earlier, except enough sensitizer should be poured onto the plaque initially so no additional will have to be poured on to coat the entire plaque. If the solution is permitted to stop flowing and then started again, a dark streak is frequently present in the final image. Also do not use a finger to spread the solution if some spot is slow to wet. This too may cause a dark area in the final image. A little practice quickly enables one to judge the amount of sensitizer to be poured onto the plate. The sensitizer which runs off the plaque can be collected in a glass dish or enameled pan, if they are acid resistant, and re-used. The length of time required for drying the sensitized plate varies with the temperature and relative humidity. During cold winter months when the relative humidity is low, the plaque may dry within 5-10 minutes at a temperature of 70 °F (21 °C). During hot summer months with high humidity, a little more time may be required. It is advisable to consider 110 °F (43 °C) as a maximum drying temperature. If non-acid resistant enamel is used on the plaque it will have a severely etched surface when removed from the dryer. This surface is not suitable for this process. Place the negative glossy side down in a printing frame, and the dry sensitized plate on top. The sensitized surface is in contact with the emulsion side of the negative. A 500 watt photo flood in a 12″ (30.5 cm) reflector at a distance of 24 (61 cm) from the printing frame is suitable. It is not necessary to use a diffusion screen over the reflector. Exposure time will depend on the density of the negative, however 8-10 minutes is a good starting point. The exposed surface will pick up moisture in direct proportion to the amount of light received during the exposure. In order for the right amount of moisture to be picked up, sufficient time must be allowed, and the relative humidity must be within certain limits. No references have been found, nor has the writer performed exhaustive experiments, to establish a scientific relationship between length of exposure, length of aging and relative humidity. Careful record keeping over a period of time would provide a valuable guide. Our limited experience indicates a relative humidity of 45 to 60% is very suitable. During higher humidity conditions, the length of exposure as well as the length of aging can be reduced some to reduce the amount of moisture picked up. Perhaps in extremely high humid conditions the plaque should be heated slightly to remove some of the moisture picked up. During low humidity conditions, changes in exposure and aging times will not be very effective. The relative humidity must be increased in order to have moisture available. This can be as simple as placing a damp sponge in a cigar box where the exposed plaque is aged. This can easily be overdone. A well soaked sponge can easily raise the relative humidity inside a small box to 80-90%. The serious worker would construct a cabinet equipped with both a dry and a wet built thermometer. The readings of the two thermometers can be converted to a relative humidity measurement by referring to tables in a handbook of chemistry and physics. A small amount of steam could be injected into the cabinet to arrive at a suitable humidity to permit an aging time of 2-4 minutes. Humidity control would also be very helpful in controlling the gum-dichromate process described earlier. The picture is developed by dusting the exposed surface with a ceramic pigment as described earlier. If the surface does not pick up enough pigment after a reasonable time of dusting, it should be allowed to age another minute or more and redusted. This may be repeated a couple times if needed. Actually better control can be exercised if the picture develops slowly. The plaque can be washed in water 15 minutes after the dusting is completed. Washing for 10-15 minutes in 80 °F (27 °C) water is normally sufficient. After washing, air dry the plaque for 30 minutes, place on top of the furnace for 5-10 minutes, then fire at 1350-1450 °F (730- 790 °C) for approximately 2-2½ minutes. The firing technique shown in Fig. 4 is recommended. The stainless steel fixture is preheated prior to receiving the plaque. As mentioned above, it is important to use copper plaques for this process. When steel plaques are used for this process, they almost always show a sizable yellow discoloration after firing. The exact cause has not been determined. Touching up and transparent cover enamelThe previous discussion on touching up applies equally to this method. Ferric chloride carries a CAUTION label. It is harmful if swallowed. It is a moderate irritant to skin. Wash thoroughly after handling. It is deliquescent and container should be kept tightly closed. It evolves heat in contact with water. Tartaric Acid carries a USE CARE label, which indicates no special precautions are necessary. However, handling care generally in keeping with safe laboratory practice is recommended. Mention was previously made of Alphonse Louis Poitevin patenting his first carbon process in August 1855. He mixed powdered carbon in dichromated gelatin, spread it on paper, exposed it under a negative, and after washing, there remained a picture formed by the pigment contained in the insoluble parts of the gelatin, the thickness varying according to the density of the different parts of the negative. The pictures possessed deep blacks and masses of white without middle tones. The reason for the lack of middle tones was discovered by J.W. Swan who patented an improved carbon process in 1864. Like Poitevin, he mixed powdered carbon in dichromated gelatin, spread it on paper, and exposed it under a negative. At this point, his process differed from Poitevin’s. The face of the exposed carbon tissue was adhered to a paper support. It was then soaked in hot water until the original backing paper could be detached. Then, as in Poitevin’s process, hot water was used to dissolve the soluble gelatin which had not been rendered insoluble due to the denser parts of the negative blocking out the light. 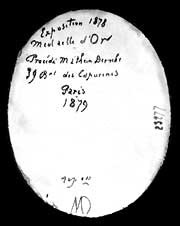 Poitevin’s image was on a black background of soluble gelatin which could not be dissolved because the insoluble areas on the previously exposed surface prevented the water from reaching the soluble under layers. Swan’s image was on a white background and all the soluble gelatin could be reached by the water. Thus Swan’s pictures had good tonal gradations. The carbon pigment could be replaced with pigments used for oil painting to make pictures other than black and white. The final step was producing color prints. Blue, red, and yellow pigment papers were exposed to three color-separation negatives, developed, and transferred to the same support, first the blue, then the red, and finally the yellow on top. The process of transferring layer upon layer of pigment to a single print, perfectly aligned, was a very painstaking one. As late as the early 1940’s this was the favored process for producing color photographs by commercial photographers. It was favored because the color prints were as fade proof as oil painting. But permanence lost out to convenience, and photographers switched to dye-transfer procedures so common today. By substituting a ceramic pigment for the oil painting pigments an image could be placed on pottery, glass, or vitreous enamel and fired-in for real permanency. The Autotype Co. of London sold this product as “Ceramic Tissue” until the late 1940’s. Many readers may be discouraged seeing a rather long description of the process. Actually this process is no more involved or difficult than previous methods once the ceramic tissue is made. When the ceramic tissue could be purchased, the enameler was able to produce a fired image without an excessive amount of work. One important advantage of this method is the ability of the paper to be applied to a curved surface, as well as a slightly domed surface. The principle ingredient of the pigmented coating is gelatin. Gelatin is used in a great number of products such as photographic film, lithography, adhesives, capsules for medicinals, desserts, jellies, marshmallows, etc. It is a product obtained by the obtained by the partial hydrolysis of collagen derived from the skin, white connective tissue, and bones of animals. The earliest commercial manufacturer appears to have been in Holland around 1681. In photography, the earliest mention of gelatin is dated 1847 when Niepce experimented with it as a vehicle for holding silver iodide on plates. There are two general types of gelatin. Type A is derived from an acid-treated precursor and Type B from an alkali-treated precursor. From this point on both are converted to soluble gelatin by heating with water in extraction kettles, further refined by filtering, concentrated by vacuum evaporation and finally dried. Gelatin is graded according to gel strength, viscosity, ash content, etc. The best gelatin for our purpose is a Type B, bone gelatin. Readers interested in more information concerning gelatin should write: Gelatin Manufacturers Institute of America, Inc. 516 Fifth Ave., Suite 507, New York, NY 10036 and ask for their pamphlet titled “Gelatin”. Fig. 7 shows the equipment we use for making ceramic tissue. The laboratory oven is model SW-11TA manufactured by Blue M Electric Company, Blue Island, Illinois. H has a temperature control system which controls the temperature within three or four degrees. Most chemical and scientific supply houses carry this or similar ovens. The glass beaker shown in the oven is 250 ml capacity. Though difficult to see there is a 3½” (8.9 cm) diameter watch glass on top of the beaker. These sizes are ideal for the size batch described below. The beaker is used to dissolve the gelatin in water and the oven provides the necessary heat. A less satisfactory method is using a double boiler (normally used in the kitchen) and a hot plate. Enamelers need no explanation of an atomizer. The glass graduated cylinder is 25 ml capacity. The size is not critical however a larger one is inaccurate when measuring small quantities. The mortar is 3½” (8.9 cm) inside diameter and 2″ (5.1 cm) deep. This is suitable for the size batch described below. The steel plate and rod are used to apply the pigmented coating to paper. The size is not critical, however the plate shown is 5″ x 10″ x 5/32″ (12.7 x 25.4 x 0.40 cm) and the rod is ½” (1.27 cm) in diameter. The two strips on the plate will be explained later. The expanded metal cylinder is used to dry paper which has been coated with the pigmented gelatin. Again, size is not critical. The one shown is 7″ (17.8 cm) in diameter and 7″ (17.8 cm) long. When paper coated with pigmented gelatin becomes dry it is rolled onto the paper tube. Again size is not critical. The one pictured is 1½” (3.81 cm) in diameter. The metal box is used to store finished ceramic tissue. Being air tight it keeps a constant humility. When gelatin granules are immersed in cold water, they hydrate into discrete, swollen particles. On being warmed, those swollen particles melt to a solution, or more strictly speaking a dispersion. The above concentration is a free flowing liquid at 40 °C (104 ºF), however at 30 °C (86 ºF), it becomes a rather firm gel. Steps must be taken to keep the pigmented coating as close to 40 °C (104 ºF) as possible throughout its manufacture. Several suggestions will be made in the following instructions. Place the water into a container such as a 250 ml beaker. The gelatin is poured in quickly and the beaker swirled causing the water to move in a circular path to get all of the gelatin wet as quickly as possible. If the gelatin is a fine powder, it may set up as a gel before H has all become wet, unless this procedure is followed. Coarse grains of gelatin present no problem. Place a watch glass on top of the beaker (this is important} and place into the oven at 40 °C (104 ºF). Sufficient time should be spent to check and regulate the control on the oven to maintain a temperature close to 40 °C (104 ºF). It is advisable to set a mortar and pestle into the oven at this time. After 6 to 8 hours the gelatin should be a clear syrupy solution with perhaps a few small bubbles on top, along the wall of the beaker. Remove the bubbles by spraying a small amount of alcohol onto them. The alcohol reduces the surface tension so the bubbles can break. Use the normal atomizer used to spray water when using the stencil technique of enameling. Place the black ceramic pigment into the mortar, which remains in the oven. Measure the glycerin into the graduate cylinder and set it into the oven. After 15-20 minutes remove the mortar and pestle with the black ceramic pigment The glycerin is taken from the oven and added to the pigment Mix quickly but thoroughly with the pestle. Remove the beaker of gelatin solution and pour a small amount into the mortar. Return the beaker with remaining gelatin to the oven. Mix quickly with pestle. Add the rest of the gelatin solution, mix quickly, drain the mixture from the pestle, scraping with a spatula if desired. Place a watch glass on top of the mortar and set it back into the oven. Examine the pigmented gelatin after a period of about 30 minutes. If there are bubbles on the surface spray with alcohol and return to the oven. When all bubbles have been eliminated, proceed to the next step. We have not made an exhaustive study to determine the best paper to use. A few such as kraft, bond, stencil, and copy paper for plain paper copiers have been tried. Of these 20 lb. white copy paper appears to be most suitable. It is recommended the beginner start with strips of paper three to four inches wide and eight to ten inches (20.3 to 25.4 cm) long. Our preferred method of coating is shown in Fig. 8. Technically it is classified as a doctor blade method. The two strips at the front end are stacks of paper strips held in place with transparent tape. The height of the strips shown are 0.018″-0.020″ (0.46-0.51 mm). The thickness of the paper being coated is 0.0035″ (0.09 mm). The thickness of the wet coating applied would theoretically be about 0.0175″ (0.04 mm). The dry coating is generally 0.0035″-0.0045″ (0.09-0.11 mm) in thickness. As mentioned above every precaution should be taken to maintain the temperature of the pigmented coating until it has been applied to the paper. Place the steel plate and rod into the oven and allow it to reach the temperature of approximately 40 °C (104 °F). When ready to coat, remove the plate, place a strip of paper in position and lay the rod across the plate, supported by the two stacks of paper strips. Pour a small amount of the pigmented coating onto the paper to the rear of the rod. Holding the rod firmly with one hand pull the paper with the other hand at a rate of about 10″ to 12″ (25 to 30 cm) per second. If the paper is pulled too slowly the coating on the paper will be too thin. If pulled too quickly, the coating may not cover all parts of the paper. A few trials will indicate the proper speed. Our preferred way to dry the coated paper is to lay it across an expanded metal cylinder as shown in Fig.8. About 1½ to 2½ hours will be required for the coated paper to dry. As it dries the edges tend to curl upwards if permitted to dry too long, the paper becomes brittle and cannot be flattened without breaking the coating. As soon as the surface of the coating is dry, the paper should be rolled onto a paper tube. We use a tube about 1½” (3.81 cm) in diameter. The coated side of the paper is toward the outside. Several strips can be rolled on top of each other, and they can be held in place with a string or a rubber band. A piece of wax paper can be inserted between the strips if desired, however it is not necessary if the coating is dry when touched. The rolled paper should be stored in a closed metal container. A second method described by Marton is as follows. “First sponge the paper with water, remove superfluous moisture, place one sheet over the other, cover with a clean sheet of glass and let rest for about an hour. (The present writer prefers to wrap the stack of paper in aluminum foil and store the package in the oven until used.) Pour the pigmented coating into the small tray, and fill the lower one with warm water, and place a small gas stove underneath to keep up a uniform temperature.” See Fig. 9. “To coat, roll up the paper the narrow way, and carefully placing it upon the solution, take a hold of the corners opposite and immediately begin to pull it with an even upward motion, without stopping until the whole sheet unrolls itself and is pulled from the solution.” We find strips can be coated in this manner if the ends are taken, one in each hand, hands held vertically one above the other, top hand lowered until a loop is formed at the bottom, the loop brought into contact with the coating solution, and then; the lower hand raised as the upper hand is lowered, thus pulling the strip of paper across the top surface of the coating. Moving the strip too slowly will pick up very little coating. Moving it too rapidly will pick up too much coating. Coated paper is dried by one of the methods described above. Wall and Jordan [ 32 ] describe another method. “Strain the warm mixture into a flat dish standing in warm water, and clear the bubbles off the surface with a strip of paper or thin card. Hold the paper to be coated upright at the further end of the dish, its lower edge just touching the liquid, and gently lower it onto the surface. Float for two minutes, and raise with a steady motion; allow to drip and hang up to dry.” The flat dish can be left in the oven rather than placing it into warm water. Also spraying the surface with alcohol is a more effective way to eliminate the bubbles. The last three methods are workable, however, they are more difficult to control. It is usually necessary to increase the temperature of the pigmented coating to 50 °C (122°F) or more, but never more than 60 °C (140ºF). Also the water content may be increased, perhaps up to 33% more. Once the proper water content and temperature has been determined fairly consistent results can be obtained. A common disadvantage of the last three methods is the long drying time of four to five hours. When ceramic tissue could be purchased it was relatively easy to transfer a photo image to a vitreous enamel surface, or to a pottery surface either bisque or glazed. The same is true today once you have manufactured the ceramic tissue. We doubt many readers will go to the trouble to do so. Perhaps if enough interest is generated someone might consider manufacturing and selling it. In describing the use of the tissue we will use the same general order used to describe previous methods. A full size black and white negative is required for this process. For further comments, see Vol. 5, No. 1, Page 2. Enameled steel plaques are best for this method. Due to the high temperature required for burning off the organic matter, it is difficult to prevent hair lining and crazing when copper plaques are used. AW-1 or LF100 white applied over ground coat is recommended. Soak the gelatin and water for 15-20 minutes, then place into the oven at 40 °F (4 ºC) until the gelatin is completely dissolved. This normally takes about two hours. Remove from oven and add the chrome alum, stirring to assist in dissolving. Solution can be filtered through a piece of cloth, but not through filter paper. Apply to the enameled steel plaques by flow coating as described earlier and then stand on edge to dry at room temperature. The purpose of the coating is to promote adherence when the exposed ceramic tissue is transferred to the enamel surface as described below. Gelatin is much more soluble in a solution of dichromate than it is in plain water of the same temperature. Therefore the temperature of the sensitizer should be controlled when being used to sensitize the ceramic tissue. Marton [ 33 ] recommends a temperature between 60 °F (16 °C) and 70 °F (21 °C) in winter and between 50 °F (10 °C) and 60 °F (16 °C) in summer. This can be accomplished by placing the dichromate in the refrigerator (not the freezing compartment) for a half hour or so before using. Other times it can be stored at regular room temperatures. Put the cooled dichromate solution into a shallow tray. Submerse the ceramic tissue, face down, into the solution for 15 seconds. Remove, allow to drain, lay face up on the expanded metal cylinder, and place in a dark area (can have a yellow or red light) to dry. About 2 hours will be required until it is dry when touched with the fingers. Again it should be rolled onto a paper tube and placed inside a metal container until ready to use. Place the negative glossy ide down in a printing frame, and a piece of ceramic tissue coated side down on top of the negative. A 500 watt photo flood in a 12″ (30.5 cm) reflector at a distance of 24″ (61 cm) from the printing frame is suitable. Exposure time will depend on the density of the negative, however 2-2½ minutes is a good starling point. Place the exposed ceramic tissue, face down, into a shallow tray of water at 70-80 °F (21-27 °C). As soon as the tissue touches the water it will begin to curl inwards which is caused by the paper swelling or expanding more rapidly than the gelatin film. The curling is best prevented by keeping the tissue on the bottom of the tray by pushing gently on the back of the tissue with the fingers. The gelatin film absorbs the cold water and expands gradually until it flattens out, when it immediately begins to curl the other way due to the gelatin having a greater expansion than the paper. When the tissue flattens out remove it from the water and place it coated side down onto the enamel surface in its proper position. It is not practical to try moving or adjusting the alignment once the tissue is placed on the enameled surface. Use a rubber squeegee, starting at the center and moving to the edges, to insure good contact. Remove the excess moisture from the back of the tissue with a paper towel. Allow to set at room temperature for 15 minutes. If the tissue is left in the water after it flattens and begins to curl the opposite direction, it will have insufficient adherence to the enamel surface. Submerse the enamel plaque into a shallow tray of water at 70-75 °F (21-24 °C) The side to which the ceramic tissue is adhered is up. After two to three minutes add hot water gradually to increase the temperature to about 85 °F (29 °C). After another two to three minutes gradually increase the temperature to 100-105 °F (38-41 °C). Within three to five minutes the gelatin coating can be seen oozing out around the edges of the tissue. The backing paper is removed by taking one corner and gently peeling it away while still submersed in the water. If it does not peel away easily, it was not soaked long enough at the higher temperature. At this stage the gelatin coating has been rendered almost entirely insensitive and the remainder of the operation can be done under ordinary room lights. The soluble gelatin coating is removed by holding the plaque under a gentle stream from a hot water faucet. The temperature of the water should be approximately 105 °F (41 °C) and must never exceed 130 °F (54 °C). The image will gradually emerge from beneath the dark mass of pigmented gelatin. Judgement must be used in deciding when the best image has been obtained. At that point the washing is discontinued and the plaque is set on edge to dry. Our procedure is to allow the plaque to dry about one hour, at room temperature, prior to firing. Drying for 24 hours seems to present no problem. Due to the large amount of organic material present, firing is a delicate procedure. It is very desirable to use a furnace with a controlling pyrometer. Place the plaque into a cold furnace, set the pyrometer at 350 °F (175 °C) and turn the furnace on. At the end of each 30 minutes increase the temperature setting 100 degrees until 750 °F (400 °C) is reached. At about 500 °F (260 °C) the image becomes a rich brown color. It continues to darken until at 650 °F (343 °C) it is brownish black. At this stage, the situation appears questionable. However at 750 °F (400 °C) the image clears up as the organic material is eliminated leaving an image consisting only of ceramic pigment in some instances it may be necessary to leave the plaque at 750 °F (400 °C) for one hour to completely eliminate the organic matter. The temperature can be increased to 800 °F (425 °C) if necessary. Remove the plaque from the furnace and set it in a safe area. Turn the furnace up to 1450 °F (790 °C) and let the furnace soak a while after it has reached the temperature. In the meantime if any part of the image is to be eliminated the pigment can be removed; with a paper stump or suitable brush. Use a stainless steel channel firing rack as shown in Fig. 4. Pre-heat the fixture for one or two: minutes, remove it, and set it on a fire resistant surface. Using a spatula carefully place the plaque onto the fixture, wait 15 to 20 seconds and then fire for about 2¼ minutes. The discussion in an earlier section applies equally to this method. Health hazardsPotassium dichromate carries a “warning” label. See the previous discussion of this material. The principle advantage of the substitution process is it s high sensitivity which permits the making of enlargements from a normal black and white negative. This high sensitivity is due to silver halides. The group of elements chlorine, bromine, iodine, and fluorine are called halogens, from the Greek name for sea salts. The first three elements all occur in sea water. With silver these halogens form compounds called silver halides which are sensitive to light. Silver fluoride is soluble in water, while the other three halides are only slightly soluble in water. Crystalline particles of these slightly soluble silver halides are the light-sensitive substances of most photographic film and paper. A photographic silver image can be applied directly to an enamel surface. The image can be protected with clear lacquer, but for real permanency it must be fired in. Unfortunately silver produces a weak yellow color in glass when fired. This is not a desirable result. However, other metals can be substituted for the silver in the image by chemical means. By substituting metals or combinations of metals which produce black, dark blue, or other pleasing colors in glass when fired, excellent pictures can be produced. On June 11, 1855, de Camarsac described two processes to the Academie des Sciences. One process was the substitution method which he used for black and white photos on enamels [ 34 ]. Ford [ 35 ] states the method was invented by Du Motay and Marechal, but gives no date. Henry and Ward [ 36 ] state the process was first worked out by Mr. Watson of Hull, but again no date is given. The most often published description is that of Mr. Watson’s method which, with some modifications made by N.K. Cherrill, was published in the 1886 Year Book of Photography. Photo News Almanac – London, pages 170-176. The description has been repeated in various publications, often with slight differences [ 37 ]. Briefly the process consisted of coating a glass plate with collodion, and then sensitizing in a solution of silver nitrate. A copying camera was used in a manner similar to the way an enlarger is used today to expose the plate through a negative. After developing, washing, and fixing with potassium cyanide the collodion film containing the image was stripped from the glass plate. The next stage was toning. The toning solution contained potassium chloro-iridium and gold chloride. After sufficient time in the toning bath, the film was transferred to an ammonia solution for 20 seconds, washed and then positioned on the enameled plaque. Firing the collodion film image apparently produced somewhat of a confused mass, especially in the darker areas. A special glazing technique consisting of a small amount of enamel glaze (as prepared for photographic work? ), alcohol, collodion, and methylated ether was applied very thin and fired. Usually five or six applications were required, each being fired separately, to produce an excellent picture. Cassell [ 38 ] described a slightly different procedure. The collodion positive was produced as in the above method. After developing, washing, fixing, and final washing, the image was bleached in a 5% solution of mercuric chloride. It was again washed and placed into the substitution bath. He provided two formulas, a combination of potassium chloroplatinite and gold chloride bath which produced a purple brown color and a combination of iridium chloride and gold chloride which produced a warm black tone. The toned collodion positive was washed, stripped and transferred to the enamel surface, collodion side up, and dried. The collodion film was removed by gently rubbing with a sponge moistened with ether and alcohol. When dry, the image was dusted with flux and fired. Hainbach [ 39 ] indicated other chlorides such as uranium, manganese, and iron were suitable toning agents. He stated the toned film was placed in a hypo bath to remove the silver chloride formed during the toning. The film was then stripped from the glass plate, laid face down on the enamel surface, dusted with flux and fired. Although there are some inconsistencies in the literature, it appears there are two steps involved. First, the silver in the image is replaced by another metal with the formation of silver chloride. Second, the silver chloride must be removed by solution. Basically the methods given above were probably workable. However, we believe Hainbach forgot to mention that the collodion was dissolved with ether and alcohol prior to dusting on the flux. We believe Cassell should have put the toned image into the mercuric chloride to dissolve the silver chloride formed during the toning. In general the method must be updated to use presently available materials. In the 1880’s gelatin replaced collodion making it possible to dry the emulsion prior to being used. Iridium compounds are very expensive. We have not seen them listed in chemical catalogs for years. Platinum and gold chlorides, although available, are also expensive. Uranium chloride is a no-no due to fear of radiation. Of the remaining metal chlorides capable of producing colors in glass, cobalt appears to be the most logical. It produces a pleasing black which tends to be slightly purple depending on the amount of exposure and the make up of the toning bath. The Dictionary of Photography [ 40 ] provides considerable information concerning the toning of bromide prints, and also the intensification and reduction processes of prints in general which appear useful for our purpose. Patent #3,171,742 by Charles Yu provides formulas using nickelous nitrate as a toner and ammonium molybdate as an intensifier. Patent #3,341,327 by Francis Avery suggests copper, cobalt and manganese compounds for toning. Making the photographic emulsionGathering information from various sources [ 41 ], we arrived at the following method. Place 7.5 grams potassium bromide and 0.32 grams potassium iodide into a glass beaker. Add 60 ml of distilled water. When dissolved, add 6 grams of gelatin (photographic grade). Allow to soak at room temperature for 45 minutes and then place into a laboratory oven at 50 °C (122 ºF). Dissolve 11.25 grams of silver nitrate in 60 ml of distilled water using a second beaker. Place this beaker into the oven about 15 minutes after the first one. After about 15 minutes remove both beakers from the oven. From here on use only a safe light – a red one is preferred. Pour the silver nitrate solution into the gelatin solution a little at a time and slowly. Pour about 5-10 ml, stir well with a glass rod for 10 seconds, and then pour another small amount and stir well. Continue in this manner until all the silver nitrate has been added. The precipitated silver halide crystals are white. Place the emulsion back into the oven. At the same time a third beaker containing 60 ml of distilled water and 6 grams of gelatin is placed into the oven. This was soaked at room temperature for 45 minutes previously. The oven temperature should be controlled at about 50-55 °C (122-131 ºC). After 30 minutes the gelatin should be dissolved. Remove both beakers and slowly pour the gelatin into the emulsion, stirring all the while. Spray a little alcohol onto the surface of the emulsion to remove the bubbles and place into a refrigerator to cool and gel. The refrigerator must be where there is no white light, or the beaker of emulsion must be enclosed in a light proof box. If the emulsion is not in a light proof box remember to remove the bulb from the refrigerator or replace it with a red one. The temperature of the refrigerator should be about 40 °F (4 ºC). It will take one or two hours for the emulsion to gel. The emulsion must be washed to remove certain reaction products formed during the precipitation. The traditional method is called noodling because the solid emulsion is forced through cheesecloth, tearing it into shreds or noodles. We use a cheesecloth bag approximately 10″ (25.4 cm) wide by 10″ (25.4 cm) high. The solid emulsion is scooped from the beaker and placed into the bag. A 12″ (30.5 cm) diameter, 4″ (10.2 cm) deep plastic pan filled half full with cold water and a few ice cubes is also required. The temperature of the water should not be higher than 50 °F (122 ºF). Squeeze the emulsion through the cloth into the water. This requires some time, patience, and a certain amount of gentle persuasion. The bag can be rinsed in the water and turned inside out in order to remove most of the emulsion. After a few minutes the contents of the pan is poured into the cloth bag, the water passes through the bag while the solid parts of the emulsion are retained. The pan is filled half full of cold water including a few ice cubes and the above process is repeated. The emulsion should be washed from 3 to 5 times. Apparently both too little and too much washing will decrease the emulsions sensitivity to light. Manufacturers analyze the bromine in the water as it leaves the emulsion to determine when to stop. Without this testing ability, one must find a procedure which gives suitable results and use the same procedure each time. After the final washing the contents of the pan is again poured into the cloth bag to separate and collect the solid parts of the emulsion. Squeeze the bag very gently to eliminate as much water as possible without squeezing out the emulsion. Empty the bag into a 600 ml. beaker, turning the bag inside out if necessary to remove the last portions of emulsion. Place the beaker into the laboratory oven and heat at 50-55 °C (122-131 ºC) for about 30 minutes. This stage is referred to as chemical ripening which effects the light sensitivity. There is an optimum time and temperature for different emulsions known by the manufacturers. Again we must find a suitable procedure and try to duplicate it. In general longer ripening increases the emulsions sensitivity, up to a point, and then it decreases. Prolonged ripening also causes fog when placed in the developer. Transfer the emulsion from the beaker to a glass or plastic bottle which is rather small in diameter. We use a plastic bottle 2″ (5.1 cm) dia. by 5œ” (12.7 cm) tall, with a screw cap. Store in a refrigerator until needed, and protect it from white light. Soak the gelatin and water for 45 minutes, then place into the oven at 40-50 °C (104-122 ºC) until the gelatin is completely dissolved. This may take 30 minutes or more. Remove from oven and add the chrome alum, stirring to assist in dissolving. Solution can be filtered through a piece of cloth, but not through filter paper. Apply to the enameled plaques by flow coating as described earlier and then stand on edge to dry at room temperature. Without this pre-coat the emulsion will be washed off the plaque in the development stage described below. Application of emulsionThe solid emulsion which has been stored in the refrigerator must be liquefied before it can be applied. A simple method is to set the bottle of emulsion into a small bowl which in turn sets in a sink directly under a water faucet. Run hot water (about 110 °F – 43 ºC) into the bowl. Once it is full reduce to a gentle stream to maintain the temperature. Rotate the bottle occasionally but do not shake it to cause bubbles. Several minutes will be required to liquefy the emulsion. Whether or not it is liquid can be determined by gently tilting the bottle. Unless the emulsion is in a dark bottle this operation must be done using a safe light. In any event all operations from here on must be done using a safe light. The wetting property of the emulsion is such that it does not flow coat well on the pre-coated enamel surface. This makes it impractical to flow or pour the emulsion onto the enameled plaque and then stand it on edge to dry. It can be poured onto the surface providing a plastic or glass container is placed underneath to catch the nun off. A finger can be used to assist the spreading so the complete surface can be wetted and the excess poured off. Then the coated plaque should be laid onto a flat surface to dry at room temperature. This provides a fairly even coating which in most cases is satisfactory. The run off material can be reused. In many cases H may be desirable to apply a second coat after the first coat is dry. 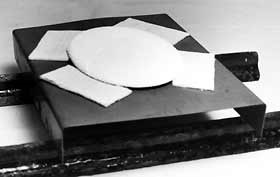 A second method is to wrap a piece of œ” tape around the edge of the plate. The width of the tape being centered along the edge. The bottom half of the tape is sealed against the bottom of the plate. Thus producing a tray where the enameled plaque is the bottom and the tape forms the rim. Pour the emulsion into the tray using a finger if necessary to wet the entire surface. Empty the tray back into the container of emulsion and set the tray flat to dry. 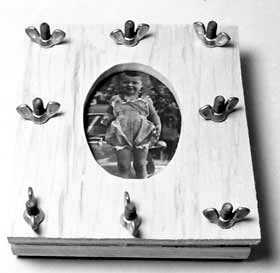 A normal black and white negative is placed into an enlarger and the enamel plaque is placed onto the frame which normally holds the enlarging paper. Of course, the dry emulsion side is up. The length of exposure will vary depending on the distance of the bulb from the plaque, the opening of the aperture, speed of the emulsion, etc. Normally it will be between 15 and 60 seconds. The first emulsion we made required 3 minutes. The image is processed the same as any enlargement paper. First in a bath of developer, rinsed, fixed, and rinsed again. We use Kodak Dektol developer making a stock solution according to the instructions on the packet. For use we dilute one part of the stock solution with three parts of water. Development time is usually between one and three minutes at about 70 °F (21 ºC). The fixer is sodium thiosulfate (hypo) sold by Kodak and other manufacturers. Normally 5 to 10 minutes in the fixer at about 70 °F (21 ºC) is sufficient. After fixing and rinsing the remainder of the process can be done in regular light. Two stock solutions are made for this step of the process. After the final rinse in the development step, place the plaque face up in an empty enamel, glass, or plastic tray. Measure out equal volumes of the above two solutions, each in a separate glass beaker. Simultaneously pour the two solutions into the tray containing the plaque. When these two solutions are mixed together the resulting solution deteriorates rather rapidly, therefore mix as suggested. Five minutes in the bath is sufficient, however a little longer presents no problem. Agitate the solution by rocking the tray gently throughout the period of time. During this treatment cobalt replaces the silver image in proportion to the silver densities. Wash the plaque in cold water for one minute. The bath should be discarded and a new one made for each plaque. Removal of remaining silverTwo stock solutions are made. Put the acid directly onto the lead nitrate. Allow to stand 15-20 minutes, then add about 100 ml of the water and stir to assist dissolving. Add the rest of the water and stir well. The rinsed plaque from the previous step is placed in an empty enamel, glass, or plastic tray. Measure out equal volumes of the above two solutions, each in a separate beaker. Simultaneously pour the two solutions into the tray containing the plaque. Agitate the solution by rocking the tray gently for 30 seconds. A total of ten minutes in this bath is sufficient. Wash in cold water for 10 minutes. Remove and stand on edge to dry. We normally dry over night at room temperature. FiringSince the concentration of gelatin is quite low the plaque can normally be fired the same as a regular coat of enamel. That is, it can be placed directly into a furnace at enameling temperature without a burn-off at a lower temperature. Fire at approximately 1450 °F (790 °C) for 2¼ minutes. Touching up and transparent cover enamelThe previous discussion on applies equally to this method. Health hazards This method is not recommended for children. It also is not recommended for adults with poor work habits. Dektol developer, cobalt chloride, sodium citrate, potassium iodide, and potassium bromide all carry a general label. Contact with skin may cause irritation, avoid breathing dust, do not get into eyes, do not swallow, and keep from children. Chrome alum and acetic acid carry warning labels. Avoid breathing, contact with eyes, skin, and clothing. Keep in tightly closed containers. Wash thoroughly after handling. Harmful if swallowed. Keep from children. Potassium ferricyanide carries a health hazard label. Harmful if swallowed. Emits toxic fumes when heated or in contact with acids. Do not take internally. Do not get in eyes, on skin, or on clothing. Do not breathe dust. Wash thoroughly after handling. Keep container closed and away from heat. Do not store near and avoid contact with acids. Keep away from children. Silver nitrate carries a reactive, contact hazard label. May be fatal if swallowed. Strong oxidizer. Causes eye bums. Do not get in eyes, on skin or clothing. Do not take internally. Do not breathe dust. Wash thoroughly after handling. Keep from children. Lead nitrate carries a reactive, health hazard label. Contact with other material may cause fire. Cumulative poison. Harmful if inhaled or swallowed. Keep container closed and away from heat. Do not store near and avoid contact with combustible materials. Do not breathe dust. Do not get in eyes, on skin or on clothing. Do not take internally. Wash thoroughly after handling. Keep from children. H. Gernsheim. The History of Photography. Oxford University Press. London, 1955. P. XXVII. Arts And Sciences. Bradbury, Evans & Co. London 1867. Vol. II P. 466. 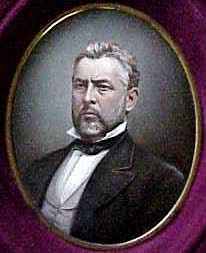 Walter D. Ford. Bulletin, American Ceramic Society. (20) 1941 P. 1. American Peoples Encyclopedia. The Spencer Press. Chicago, 1953, Vol. 15 P. 683. W. Crawford. The Keeper of Light. Morgan & Morgan, In. 1979 P. 69. Ref. #5 Vol. 15 P. 685. Jim Eder. The History of Photography. 4th Ed. Columbia University Press 1945, P. 566. W.E. Henry and H.S. Ward. Photo-Ceramics. G. Gennert, New York and Dawbarn and Ward, Ltd., London. Circa 1895. P. 66-78. W.E. Henry and H.S. Ward. Photo-Ceramics. G. Gennert, New York and Dawbarn and Ward, Ltd., London. Circa 1895. P. 25-30. Back to text H.M. Chapin. How to enamel. John Wiley & Sons. London 1911. P. 57-69. V.V. Vargin. Technology of enamels. Hart Pub. Co., Inc. New York City. 1968. P. 224, 225. Ref. 19, P. 16, 17. A.M. Marton. The modern methods of carbon printing. Bloomington, Illinois. 1905. P. 27. (a) Michael McCann. Artist beware. Watson-Guptill Pub. New York 1979. P. 218. (b) Michael McCann. Health and safety for secondary school arts and industrial arts. Ceramic industry (Mag.). Photo Ceramics – Basic Processes and Formulas. Cahners Pub. Co., Des Plaines, IL – Feb. 1946, P. 47. Julius Grunwald. The theory and Practice of enameling on iron and steel. Translated by H. H. Hodgson. Charles Griffin & Co., Ltd. London, t909, P. 108. Walter D. Ford. Bulletin American Ceramic Soc.,20 (1941), P. 2. Marton, A.M. The modern methods of carbon printing. Bloomington, Illinois, 1905, P. 236-238. Wall & Jordan. Photographic facts and formulas. American Photographic Pub. Co., Boston, 1940, P. 233. H. Gernsheim. The history of photography. University Press. London, 1955 P. 281. W.D. Ford. Bulletin, American Ceramic Society, (20) 1941 P. 1. W.E. Henry & H.S. Ward. Photo ceramics. G. Gennert. New York City, Circa 1893, P. 79. (a) Ref. #36, pages 79-88. (b) W.H. Burbank. Photographic printing methods. Scovill Manufacturing Co., New York City, 1887, P. 236-238. Cassell’s Cyclopaedia of Photography. Cassell and Co., Ltd. London, 1911, P. 98. Rudolf Hainbach. Pottery decorating. 2nd Rev. English Edition. Scott, Greenwood 8 Son. Ludgate, 1924, P. 146. E.J. Wall. Dictionary of photography. American Photographic Pub. Co. Boston, Mass. 1937 PP. 334-326, 363-368, 509-514, 589-603. (a) A. Gassan. Handbook for contemporary photography. 4th Edition. Light Impressions Corp., Rochester, NY 1977 P. 176-177. (c) American Photograph (Mag.) 1941 -1943. Various articles. Burbank, W.H. Photographic printing methods: A practical Guide to the professional and amateur worker. The Scovill & Adams Co., New York, 1891. Reprinted by Amo Press, New York, 1973, PP. 97-129, 165-188.